Marwan Barghouthi could bring peace and independence to Palestine. But he’s in jail. 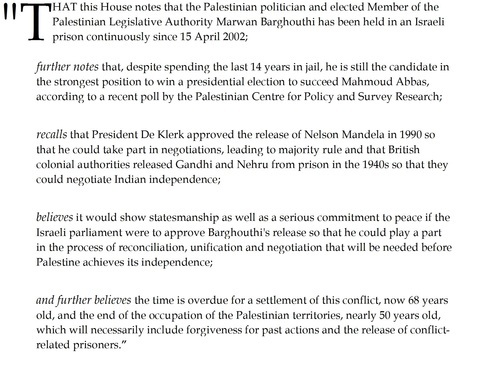 Leadi ng MPs from all parties have signed a parliamentary motion calling on the Israeli parliament to release the Palestinian MP Marwan Barghouthi who has been in jail continuously for the last 14 years. They cite the precedent of South Africa, where Nelson Mandela was released from prison so he could take part in negotiations for majority rule, and India, where Gandhi and Nehru were released by the British so they could take part in negotiations for independence. They point out that Barghouthi, now 56, “is still the candidate in the strongest position to win a presidential election to succeed Mahmoud Abbas, according to a recent poll by the Palestinian Centre for Policy and Survey Research”. The parliamentary motion was tabled by Tommy Sheppard of the Scottish National Party and its signatories include the Conservative chairman of the Foreign Affairs Committee, Crispin Blunt, and the current Father of the House of Commons Sir Gerald Kaufman. Marwan Barghouthi is seen as one of the few political leaders who could unite the country, winning support from both Fatah and Hamas, and who would have the moral authority to negotiate on behalf of all Palestinians and to preside over a process of “truth and reconciliation” in a newly independent state. He has often been called the “Mandela” of Palestine and there are certainly many paralllels both in his life so far and in the role he could play in a newly independent Palestine. He has spent a total of 20 years inside Israeli prisons and he has been for many years now in Cell 28 in Hadarim prison, a few miles from the Meditarranean beaches of Netanya. He has regular visits from his wife Fadwa, but is allowed very little other contact with the outside world. Yet he still plays an important role and the occasional statements smuggled out of prison carry a great deal of authority. Eight winners of the Nobel peace prize have signed the “Robben Island declaration” calling for his release, including President Jimmy Carter and Archbishop Desmond Tutu. and the Argentinian Nobel laureate Adolfo Esquivel has nominated him for the Nobel peace prize this year. Israel’s former president Shimon Peres said in 2007 that he would sign a pardon for Marwan Barghouthi, but it would have to be approved by the Israeli parliament and very few Israeli politicians have backed his release. Barghouthi was an MP and the general secretary of Fatah during the Second Intifada when he was abducted in broad daylight on the streets of Ramallah by Israeli secret service agents, dressed as ambulance workers, and taken to Israel. He refused to plead to an Israeli court on the basis that both his abduction and the trial were illegal and was duly found guilty of the deaths of five Israelis in military operations carried out by an armed wing of Fatah, known as “Tanzim”. Outside the court he has always maintained that he was secretary of the political party only and had no involvement or foreknowledge of military operations. He never supported violent actions targeted at civilians and, unlike Nelson Mandela, he never carried arms himself. He always insisted that Palestinians had the right to resist the occupation of their country, by force if necessary, but he believed in a political and not a military solution. However the campaign for his release, and for the release of all the 6,204 Palestinian conflict-related prisoners currently held in Israeli jails, is not based on an argument about the innocence or guilt of individual prisoners or the legality of their trials, but on the argument – in the case of Marwan Barghouthi and other political leaders – that their release is necessary for the process of negotiation leading to a peace settlement and in other cases on the argument that the release of political prisoners must necessarily precede a political solution. A poll by the Palestinian Center for Policy and Survey Research’s poll found that if a presidetial election were held and Abbas did not run, 32 % would prefer to see Barghouti replace him, nearly 20 per cent Hamas leader Ismail Haniyeh, 8 % Prime Minister Rami Hamdallah, 6% Hamas leader Khaled Mashaal, 6% Muhammad Dahlan, 4% chief negotiator Saeb Erekat and 3% former prime minister Salam Fayyad. The poll was conducted in the West Bank and the Gaza Strip from September 17 to 19, covered 1,270 adults and had a 3-percentage point margin of error. The current escalation in violence did not start with the killing of two Israeli settlers, it started a long while ago and has been going on for years. Every day Palestinians are killed, wounded, arrested. Every day colonialism advances, the siege on our people in Gaza continues, oppression persists. Some have suggested the reason why a peace deal could not be reached was President Yasser Arafat’s unwillingness or President Mahmoud Abbas’s inability, but both of them were ready and able to sign a peace agreement. The real problem is that Israel has chosen occupation over peace, and used negotiations as a smokescreen to advance its colonial project. Every government across the globe knows this simple fact and yet so many of them pretend that returning to the failed recipes of the past could achieve freedom and peace. Insanity is doing the same thing over and over again and expecting different results. We were told that by resorting to peaceful means and to diplomatic channels we would garner the support of the international community to end the occupation. And yet the international community failed yet again to undertake any meaningful steps, neither setting up a framework to implement international law and UN resolutions, nor taking measures to ensure accountability, including boycott, divestment and sanctions, which played a crucial role in ridding the world of the apartheid regime. So, in the absence of international action to end Israeli occupation and impunity or even provide protection, what are we asked to do? Stand by and wait for the next Palestinian family to be burned, for the next Palestinian child to be killed or arrested, for the next settlement to be built? This new Palestinian generation has not awaited instructions to uphold its right, and its duty, to resist this occupation. It is doing so unarmed, while being confronted by one of the biggest military powers in the world. And yet, we remain convinced that freedom and dignity shall triumph, and we shall overcome. The flag that we raised with pride at the UN will one day fly over the walls of the old city of Jerusalem to signal our independence. I have spent 20 years of my life in Israeli jails, including the past 13 years, and these years have made me even more certain of this unalterable truth: the last day of occupation will be the first day of peace. Those who seek the latter need to act, and act now, to precipitate the former.